In the retail industry, it seems as though we are constantly faced with the issue of trying to find new customers. Most of us are obsessed with making sure our advertising, displays, and pricing all “scream out” to attract new business. This focus on pursuing new customers to increase sales is certainly prudent and necessary, but, at the same time, it can wind up hurting us. Therefore, our focus really should be on loyal customers - the 20 percent of our clients who currently are our best customers. Loyal: They represent no more than 20 percent of our customer base, but make up more than 50 percent of our sales. Discount: They shop our stores frequently, but make their decisions based on the size of our markdowns. Impulse: They do not have to buy a particular item at the top of their “To Do” list, but come into the store on a whim. They will purchase what seems good at the time. Need-Based: They have a specific intention to buy a particular type of item. Wandering: They have no specific need or desire in mind when they come into the store. Rather, they want a sense of experience and/or community. 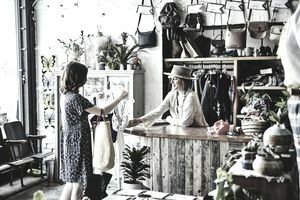 If we are serious about growing our business, we need to focus our effort on the loyal customers and merchandise our store to leverage the impulse shoppers. The other three types of customers do represent a segment of our business, but they can also cause us to misdirect our resources if we put too much emphasis on them. Naturally, we need to be communicating with these customers regularly by telephone, mail, email, social media, etc. These people are the ones who can and should influence our buying and merchandising decisions. Nothing will make a loyal customer feel better than soliciting their input and showing them how much you value it. In my mind, you can never do enough for them. Many times the more you do for them, the more they will recommend you to others. Positive word of mouth is gold for business. This category helps ensure your inventory is turning over and, as a result, it is a key contributor to cash flow. This same group, however, can often wind up costing you money because they are more inclined to return the product. This is the segment of our clientele that we all like to serve. There is nothing more exciting than assisting an impulse shopper and having them respond favorably to our recommendations. We want to target our displays towards this group because they will provide us with a significant amount of customer insight and knowledge. People in this category are driven by a specific need. When they enter the store, they will look to see if they can have that need filled quickly. If not, they will leave right away. They buy for a variety of reasons such as a specific occasion, a specific need, or an absolute price point. As difficult as it can be to satisfy these people, they can also become loyal customers if they are well taken care of. Salespeople may not find them to be a lot of fun to serve, but, in the end, they can often represent your greatest source of long-term growth. It is important to remember that need-based customers can easily be lost to Internet sales or a different retailer. To overcome this threat, positive personal interaction is required, usually from one of your top salespeople. If they are treated to a level of service not available from the web or another retail location, there is a very strong chance of making them loyal customers. For this reason, need-based customers offer the greatest long-term potential, surpassing even the impulse segment of customers. For many stores, this is the largest segment in terms of traffic, while at the same time, they make up the smallest percentage of sales. There is not a whole lot you can do about this group because the number of wanderers you have is driven more by your store location than anything else. Keep in mind, however, that although they may not represent a large percentage of your immediate sales, they are a real voice for you in the community. Many wanderers shop merely for the interaction and experience it provides them. Shopping is no different to them than it is for another person to go to the gym regularly. Since they are merely looking for interaction, they are also very likely to communicate to others the experience they had in store. Therefore, although wandering customers cannot be ignored, the time spent with them needs to be minimized. Retail is an art backed up by science. The science is the information we have from financials to research data (the "backroom stuff"). The art is in how we operate on the floor: our merchandising, our people, and, ultimately, our customers. For all of us, the competitive pressure has never been greater, and it is only going to become more difficult. To be successful, it will require patience and understanding in knowing our customers and the behavior patterns that drive their decision-making process. Using this understanding to help turn discount, impulse, need-based, and even wandering customers into loyal ones will help grow our business. At the same time, ensuring that our loyal customers have a positive experience each time they enter our store will only serve to increase our bottom-line profits.